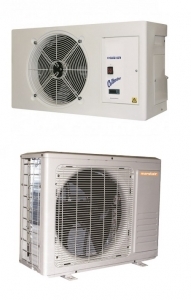 For larger cellar cooling where beers and wines have to be kept at a constant low temperature the Marstair cellar cooling system model CKEA 50, CKA 50 is worth considering. This UK manufactured cellar cooler has an easy to set electronic controller for temperature setting and is designed with a high impact resistant moulded polymer cabinet impregnated with an anti-bacterial additive to help prevent mold growth on the indoor unit. See below for the brochure on this Marstair cellar cooling system.